EXPRESSYON is a poll and satisfaction Survey solution for tablets dedicated to professionals. EXPRESSYON allows to create complete surveys where answers are made by simple touch on smiley faces, on customized icons, on Multiple Choice Quizz, identity profiles, or free text input. Surveys are created online through a simple web interface and are instantly sent to your tablets, or may be sent by calendar planning on selected days. 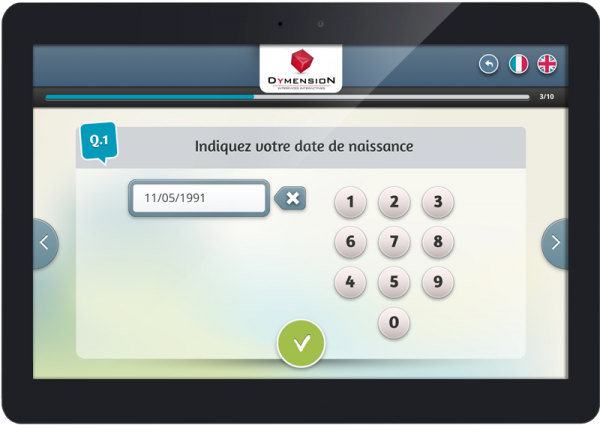 On the tablets, you are able to store multiple surveys that you can activate whenever is necessary. The calendar planning allows you to automate te whole process : the tablet will automatically use the desired survey according to the planned days. Surveys can also be broadcasted as a webpage, what allows you to give a link from your website or to send the survey by email. 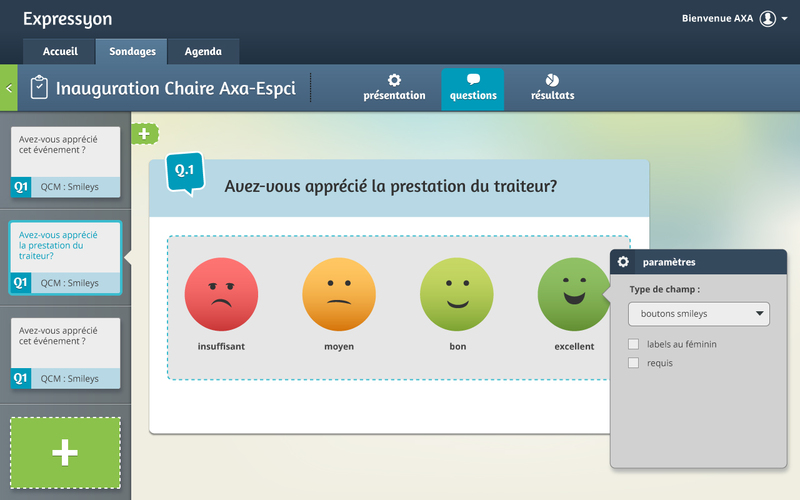 Expressyon is the top solution to measure client satisfaction, launch filed surveys or during your own events. It allows you to organize complete surveys and polls for any need, and your vsitors just answer in a fun, playful and interactive way, in a couple of seconds. 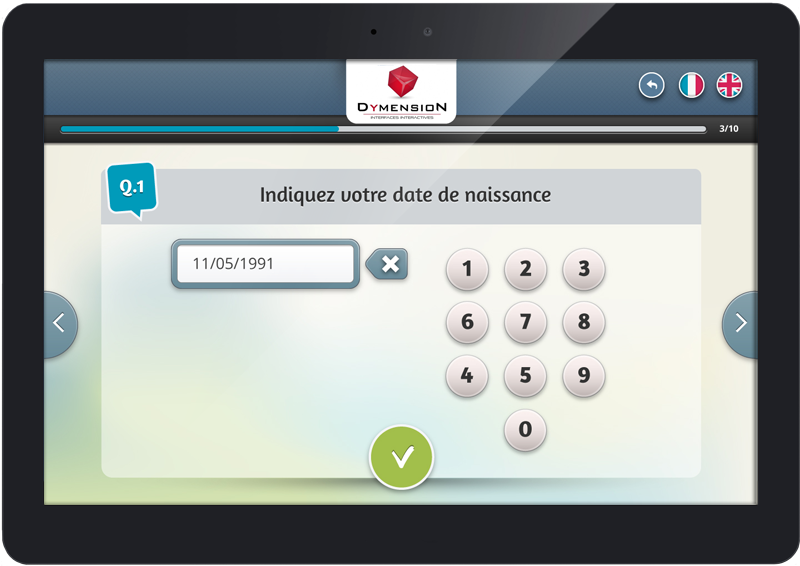 The strength of EXPRESSYON lies in its graphical interface and its fastness to gather all data (in a few touch, your visitors have answered to a chain of questions). 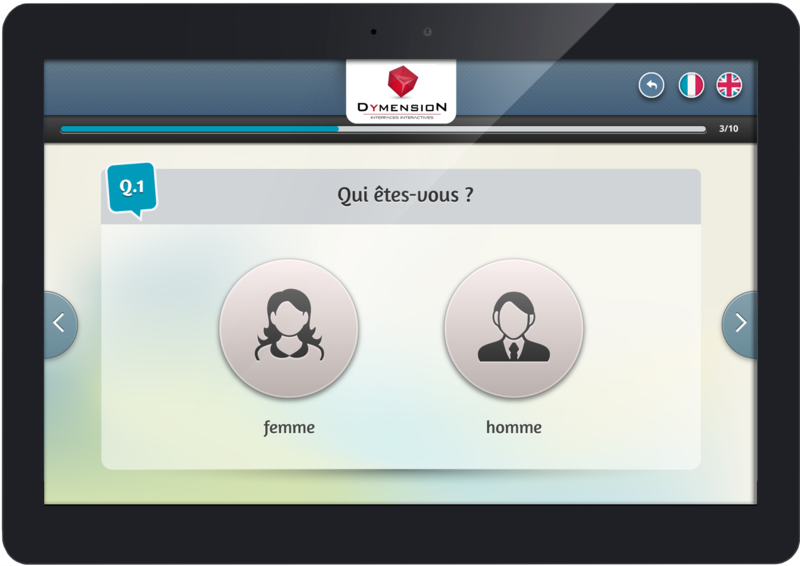 Above all, EXPRESSYON allows you to profile survey participants. Last, the gathering of data may be done without any internet connection. The data will be sent to the server at any time thereafter, as soon as a connection becomes available. Elegance: The survey is fully graphical and stylized for your visitors’ pleasure. The interface is soft and enjoyable, and you can customized the logo. We can moreover customize the full graphic chart for more demanding clients. 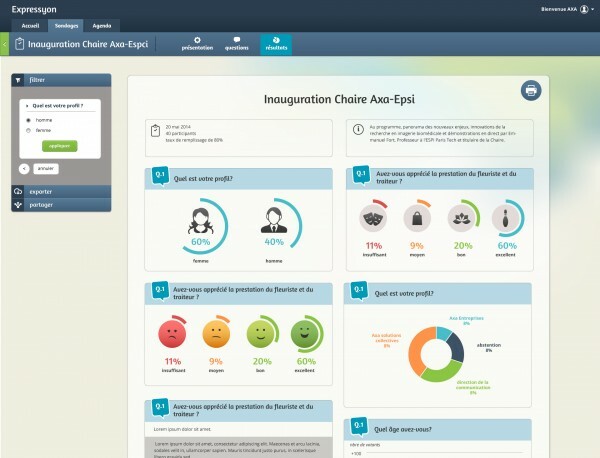 Simplicity: Creation of surveys and questions is extremely simple, under many types as smiley faces, Multiple choice Quizz, in text or with graphics, text or numbers input. 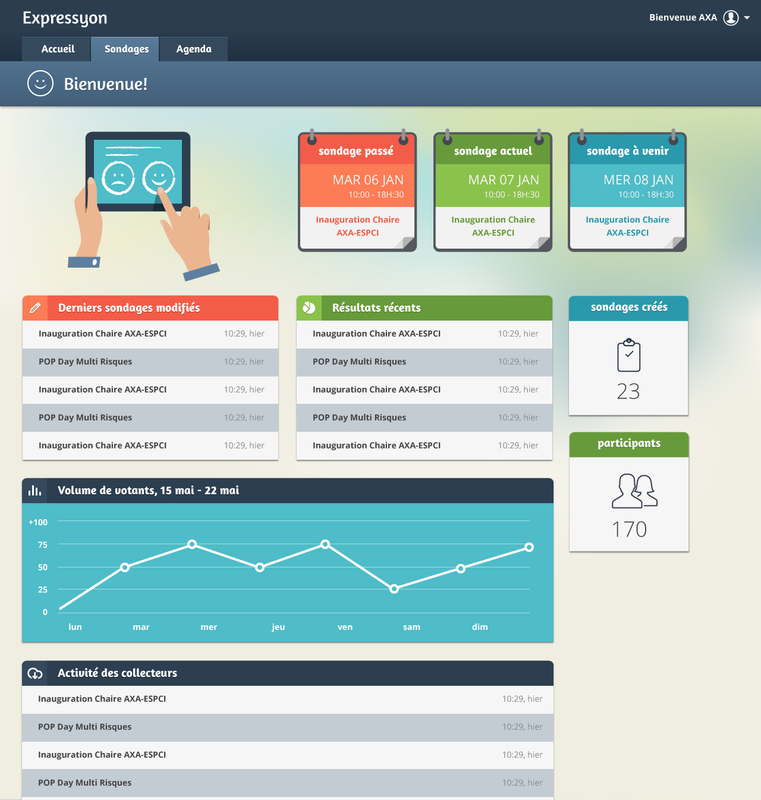 The solution manage multilingual and allows to launch your surveys in two languages and to change translation on the go. Last, the managing of multiples surveys may be done in a manual or automatized way. Fastness : Your visitors only spend a few seconds to answer to many questions. They thus can express themselves in a fun and up-to-date way, far from old fashioned paper and pen polls. Moreover, if the tablet is online, or the Survey in web mode, you will get instant real time results. Event : on your event place, don’t let your visitor go without leaving their feelings and some information about themselves, whether on kiosks tablets or on hand tablets with hostesses. And above all, use the results to communicate internally or externally, improve the client experience by taking account of their remarks, detect rejected profiles. DYMENSION can help you to manage this surveys by providind the appropriate support : 10″ or 15″ touch kiosk with professional quality, 24/7, steel case on stand VESA 100.